I love this time of year--the colder weather, the hot cocoa, the delicious holiday food and goodies, the beautiful decorations, and mostly the opportunity to focus on giving to others through celebrating God's greatest gift to us. So...I have a gift to give away to a lucky reader to show my appreciation for taking a moment of your busy day to share in my crazy passion for scrapping my story! Vintage Hip Christmas Crafts: 9 step-by-step tutorials for layouts, decor, gifts, and more by Margie Romney-Aslett and daughters Megan and Brooke. 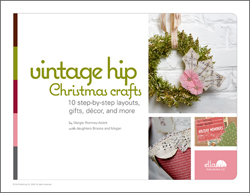 Vintage Hip Christmas Crafts: 9 step-by-step layouts, gifts, décor and more. Put on your favorite Christmas album, brew up a mug of cocoa, and pick your crafting poison. All you have to do to be entered to win this fabulous idea book is leave a comment telling me your favorite thing about this time of year by next Tuesday 12/8 at midnight. I'll announce the winner on Wednesday 12/9. And since I'd hate to see those who enter and don't win go away empty handed this time of year, I've also got a 25% off coupon code to buy this lovely ebook! Here is the code: CRAFTY09, and here is a link to the book: LINK. (That's a steal of a deal at only $4.50 people!) Thanks to Ella Publishing Co. for this awesome give away. If you haven't checked out Angie Lucas and Lain Ehmann's new e-publishing site please do. They have some awesome products by amazing scrappers. And how can you resist an adorable little elephant named Ella?? I love that during this time of year a majority of people I know reflect on Our Savior and His love for us. The cold weather is a plus!!! I love that we finally decide as a community to take care of our own, meaning people step get food, clothes, toys, etc for those in need. They do the right thing. Families try to slow down and truly enjoy the ulitmate gift, each other. I love how my daughter gets so excited at the site of any christmas lights - everything is so new to her and it just makes me so happy!